By now everyone has tried the infamous banana soft serve, right? Heck, there’s even a fancy schmancy machine to make it for you (as if your food processor or blender isn’t fancy enough). We love banana soft serve around here. But, on this elimination diet, bananas are out. Sadly, so is all fruit as of tomorrow. Pout. Whine. But, tonight? 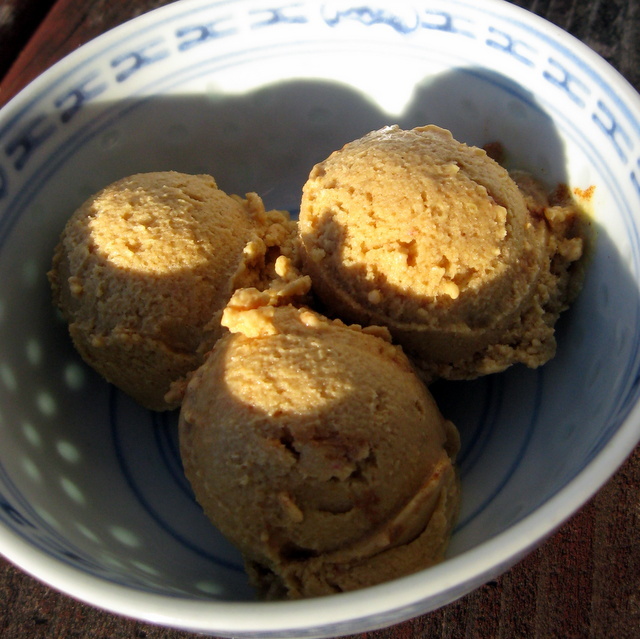 Tonight there’s still time for a super simple, 3 ingredient, vegan peachy keen ice cream. Put all ingredients in your food processor and process until creamy. If you have a serious sweet tooth, feel free to add a splash of maple syrup or a few drops of stevia. I don’t happen to need any sweetener at all. Looking for more slightly indulgent recipes? Check out Slightly Indulgent Tuesdays! This entry was posted in cinnamon, desserts, grain-free, sunflower seeds, vegan and tagged grain-free, ice cream, peaches, recipes, vegan. Bookmark the permalink. Thanks, Shirley. I’m sure almond butter would probably work, too. Alas, ’tis not part of my diet at the moment. That’s quite an interesting recipe……..looks really good. I wouldn’t have thought that ice cream had no cream in it…..
Well, the banana ice cream that’s so popular on foodie blogs doesn’t have cream in it either. This is kind of a cross between a sorbet and an ice cream. It’s not a sorbet, because there’s fat in it from the sunbutter. But, it’s not officially an “ice cream” either, since there’s no cream. But, no vegan ice cream does, eh? Did you find yourself really tired when you first cut out fruit? I’m on day 2 without it and oh so very exhausted…. not exactly tired. I did have Candida die off though. Candida yeast eat sugar, and when your starve them of sugar, they go through “withdrawl” and die — thus releasing toxins. I had fevers of 104 for 48 hours! but tiredness and lethargy are other symptoms of die off. I hope you’re feeling more energetic soon! !